UNESCO is a specialised UN agency that contributes to building peace, the eradication of poverty, sustainable development and fostering intercultural dialogue through education, sciences, culture, communication and information. UNESCO is managed by 3 governing bodies: the Director-General, Executive and the General Conference. The Director-General is elected by the General Conference to run the Organisation. The Executive Board comprises of 58 Member States elected from various electoral regions of UNESCO. Members of the Board are elected by the General Conference to monitor the work of the Secretariat with regard to implementation of UNESCO’s programmes and its decisions. The Board meets twice a year in Spring and Autumn. The General Conference comprises of Ministers responsible for relations with UNESCO, which in most cases are Ministers of Education. It takes place biennially. UNESCO’s primary objective is to build peace in the minds of men through co-operation in education, sciences and culture. South Africa was one of the core founders of UNESCO when it was created in 1946. On 31 December 1956, as a result of its apartheid policies, the former South African Government withdrew its membership from UNESCO. The new South Africa was readmitted to the organisation in December 1994 as a democratic, non-racial, non-sexist country. Since the country’s re-joining, relations between South Africa and UNESCO have been strengthened. 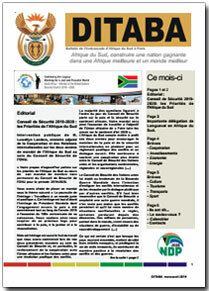 This is evidenced through South Africa’s involvement in various UNESCO Subsidiary bodies and activities. • South Africa was elected to the Presidency of the Inter Governmental Council of the UNESCO Management of Social Transformations (MOST) Programme for a two-year term from October 2005. South Africa was re-elected for another two year term in 2007. The former Minister of Social Development, Zola Skweyiya, was the President of MOST until October 2009. • Secretary of the UNESCO Commonwealth Group (2002). • Promotion of the African Agenda - through UNESCO’s Medium Term Strategy for 2008-2013 which has identified Africa and Gender as its overarching priorities. • Promotion of North-South-South Cooperation through initiatives in Education such as Technical and Vocational and Educational Training system (TVET) and with partners within the Commonwealth and elsewhere. The Republic of South Africa is a State Party to the 1972 World Heritage Convention. South Africa signed and ratified the Convention on 10 July 1997. RSA has 8 sites - 4 cultural, 3 natural and 1 mixed - inscribed on the World Heritage List. In 1999, two years after ratification, it was elected to the World Heritage Committee to serve a six year term which expired in 2005. During this period the country played a remarkable role including hosting the 29th Session of the World Heritage Committee (WHC) which led to the establishment of the African World Heritage Fund (AWHF). The AWHF was established to assist African Member States encountering challenges regarding inscription of sites to the World Heritage List as well as conservation and protection of sites that are already in the List. In October 2009 South Africa was re-elected to the WHC by the General Assembly of the Conference of States Parties to the 1972 Convention. Subsequent, South Africa was elected to the position of the Vice-Chair for Sub-Saharan Africa, representing the Group in Bureau meetings of the Committee. South Africa is not a member of the OECD but engaged the organization through the Enhanced Engagement process together with Brazil, China, India and Indonesia known as the EE5 countries. This process seeks these countries' engagement with the OECD Members on an equal footing in a growing range of policy areas. Based on mutual benefit, partnership and the sharing of OECD working methods, the Organization’s new global strategy helps to increase its responsiveness to the needs of the International community. There is a growing partnership between the OECD and Africa, co-operating with African government, Pan-African institutions and Regional Economic Communities (RECs) has 's on a wide range of public policy issues to facilitate the formulation and implementation of national and regional strategies and policies. For example, the African Economic Outlook provided the background for discussions for the 2009 AU Information and Communication Technology (ICT) Ministerial Meeting in South Africa. There is a deepening co-operation on investment policy between South Africa and the OECD, with the former being a co-Chair in the NEPAD-OECD Africa Investment Initiative Roundtables. South Africa contributes to the revision of the OECD guidelines for Multinational Enterprises, as well as discussions on international investment agreement and arbitration. The OECD project on reducing bid rigging in public procurement was extended to South Africa in 2009. The Organization has worked with the South African Competition Commission to develop a successful anti-bid rigging program which provided support to over 250 senior procurement officials’ across the government and state owned enterprises. An OECD review of South Africa's Innovation Policy was carried out in 2007. The review was well received and the South African government has shared the results with countries in the Southern African Development Community (SADC). South Africa worked with the OECD to examine three areas of innovation, i.e. enhancing the capacity to absorb technology, transferring technology and building knowledge networks. The OECD is also providing statistical assistance for the launch of an ICT Household Survey in South Africa in 2011. The support of South Africa and the OECD for African Tax Administration Forum (ATAF) complements a long-standing co-operation between the two in the tax area. South Africa takes an active part as a regulator observer, both in the OECD's Committee on Fiscal Affairs (CFA) and its subsidiary bodies with responsibility for key international tax issues including transfer pricing, tax treaties and exchange of information. South Africa also provides experts to contribute to OECD multilateral tax events held in Africa and elsewhere. The OECD plans to hold a conference in South Africa to explore protection, pensions, financial inclusion and financial education in schools and will include session focused on the National Financial Education Strategies and Initiatives in Africa. Though hosting conference, South Africa is looking to promote and lead financial education initiatives in Africa and to encourage African countries to join the OECD's International Network on Financial Education (INFE). South Africa has played a proactive role since the inception of the OECD project on Public Debt Management (PDM) and Bond Markets in Africa. This close relationship with South Africa is best exemplified by the recent initiative of South Africa to establish an OECD Centre for Africa Public Debt Management and Bond Markets. The Centre is being formally established by the OECD and South Africa in 2011. The Centre will enhance South Africa's supporting role as a conduit of good practices from the OECD to other countries by facilitating access to and encouraging the use of leading OECD practices in debt management. South Africa regularly participates in the OECD Territorial Development Policy Committee (TPDC) and its working parties. The country is currently engaged in developing and implementing a regional policy agenda to address the wide regional disparities in economic and social well-being, the spatial polarization in cities and the challenges of migration. These issues have been assessed in the OECD metropolitan review of Cape Town (2008) and are being looked at in the OECD metropolitan review of Johannesburg and the surrounding (2010). Discussions are underway for a rural policy review of South Africa. South Africa is a member of the OECD Working Group on Bribery in International Business Transactions and participates in the Working Group's peer review monitoring mechanism that oversees the implementation and enforcement of the Convention. South Africa's Phase I (2008) and Phase II (2010) had been complemented successfully. The OECD supports South Africa in its regulatory reform efforts by providing expertise, exchange of information and organizing seminars on topics such as Regulatory Impact Assessment and regulatory institutions. The 2008 OECD education review of South Africa is a valuable study that covers the entire system, from pre-school to tertiary education and lifelong learning and analyses it in terms of its economic, social and political impact. The Province of Free State participates in the OECD review of higher education in regional and city development. The report will be published in mid-2011. South Africa is a full participant in the OECD Mutual Acceptance of Data (MAD) system, a multilateral agreement that allows the results of a variety of safety tests done on chemicals, and chemical products to be shared across its adhering countries. The country has been a regular observer in the Chemicals Committee and its subsidiary bodies since 2006. In May 2010 the South African Member was elected as Vice Chair of the Working Group on Good Laboratory Practice (GLP).